I make a bad vegetarian sometimes. It's half-way through October and I just found out it's Vegan MoFo - Vegan Month of Food. But what exactly does that mean? In the blogosphere, vegans and non-vegans alike are supposed to blog about vegan food as much as possible. I've blogged about quite a few vegan things this month, so hopefully I can earn my vegan gold star for the month. 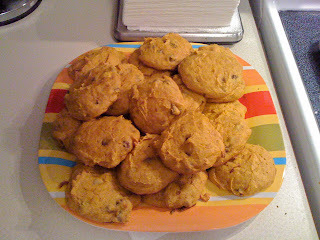 Since I'm on a vegan and baking kick (despite my horrible muffin incident last week - thinking about it makes my stomach gurgle), I decided to make an interesting sounding recipe for vegan pumpkin chocolate chip cookies from The Post Punk Kitchen the other night. 1. Preheat oven to 350 degrees (F; 175 degrees C). Grease cookie sheets. 2. In large bowl, cream together the shortening and sugar until light and fluffy. Beat in the soy yogurt, then stir in the pumpkin and vanilla. 3. In another bowl combine the flour through the cinnamon. 5. Stir in the walnuts (if using) and chocolate chips. 7. Bake for 15-20 minutes, until light brown or toothpick comes out clean. Not only do these cookies look great, but they taste great too - very cake-like. (My boyfriend couldn't even tell they were vegan!) 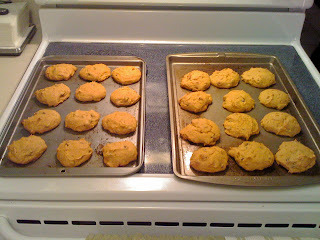 My only criticism of the recipe is that it says you'll get 48 cookies out of the recipe. Maybe I made mine too big, but I only got 24. Figuring out when exactly they were done was a little tricky, too. Since the cookies are orange, you have to keep an eye on them to see when they start to take on a golden hue and are done. Now that I've evened the score and have successfully baked 1 of 2 vegan recipes successfully, I think I'll roll the dice and try to make another vegan recipe next week. Any suggestions?